Copper screens - Hello, I’m interested in doing a copper accent wall in my home. Where did you find the copper screens and the one full panel of copper. I would appreciate any assistance. Thank you! Is the wall of the planters concrete? Beautiful landscape! - This is a beautiful landscape! Could you please tell me the name of the large leaf plant on the left side of the picture, in front of the tomato plant? Thank you in advance. Choose a screen. The curved screen in the corner of this courtyard is an attractive feature in its own right, thanks to the decorative cutwork pattern, and offers an elegant way to hide ugly plastic bins from view.By using a screen like this, you can section off as much of the garden as you need — to store bikes or garden equipment as well as bins. To blend in the structure even further, you could grow climbers up and over the screen or along the wall behind. 3. Conceal Behind a ScreenA screen can be a space-saving strategy for concealing garden elements in tight quarters, as it can be positioned as close to the fence or as far away as needed to accommodate bins, bikes or garden tools. In this Sydney backyard by Outhouse Design, a custom laser-cut Cor-Ten steel screen separates the garbage and recycling bins from the seating area while providing an attractive backdrop. 3. Conceal Behind a Screen A screen can be a space-saving strategy for concealing garden elements in tight quarters, as it can be positioned as close to the fence or as far away as needed to accommodate bins, bikes or garden tools. 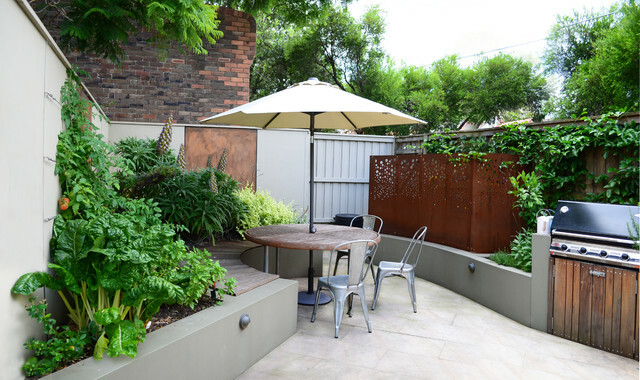 In this Sydney backyard by Outhouse Design, a custom laser-cut Cor-Ten steel screen separates the garbage and recycling bins from the seating area while providing an attractive backdrop.